In this article I will examine a specific photographic image. Lee Friedlander’s photograph, Albuquerque, New Mexico (1972) is the image I intend to scrutinise. Whilst attempting to deconstruct this work, I plan to reveal certain implications that I judge it contains and explain what these mean to me. By deconstructing it I intend to discuss some of the main themes I deem the image conveys about the times in which it was made and the relevant historical period. In conjunction with this subject, I will firstly, briefly examine the category of Postmodern Photography; one which this photographer and his work are often classified as being a principal part of. Whilst doing this I will also explain what some of the important thematic implications relating to this terminology are. Through this critical process, I will attempt to demonstrate how an artwork can be an interesting allegorical interpretation of reality. In a referential sense, Albuquerque, New Mexico (Fig 1) by Lee Friedlander (1934 - ) is a seemingly indistinct image that contains many obvious characteristics related to a typical postmodern city scene from that time. As I intend to formulate an individual interpretation of possible ‘meaning’ within an image - as a central aspect of this paper - this is why I have chosen a photographic work from the ‘postmodern canon’. The ambiguous nature of images linked to this fairly unsatisfying idiom, almost universally encourage such analyses to be made. In my view the intriguing nature of this ‘ambiguousness’ is fundamental to their artistic appeal. In fact this process of critical interpretation and reinterpretation was, and still is a central factor in the ongoing deliberation on these postmodern photographic artworks. Friedlander is a photographer who has come to be categories as the archetypal Postmodern Photographer and this work is a prime example of an image directly categories by these terms. The photograph itself is of an American city scene and shows a dog sitting at an ‘intersection’, dwarfed by a fire hydrant that sits in the central foreground of the shot. Friedlander makes informal, seemingly unplanned images; similar to other allied photographers from this period and ‘grouping’ (the most famous of his peers being Diane Arbus (1923 – 1971) and Garry Winogrand (1928 – 1984)). Ambiguity appears as being essential to Friedlander et al.. This has become integral through the critical assessment of their work because it naturally allows for more subjective readings to be made. Martha Rosler states in her essay on Friedlander’s photography that: “It had aimed to signify a transcendental statement through subtraction or rationalized arrangements of elements within a photographic space”. This of course could be said about any visual image, which Rosler concedes. However Friedlander’s work invites the viewer to do this right from the moment one starts looking at the image. There are no overtly attractive details to admire or any initial obvious contexts. This is an image which is intriguing because of its uncertain purpose and unconventional relationship with more traditional photographic treatments. I feel the task here for Friedlander as Photographer is an instinctual one. In a sense the creation of the work relies on a certain amount of chance. However I consider the physical action and technical processes needed are heavily supported by a critically informed background and a certain defined purpose. These decisions and judgements must be made in order to create such an image. This photograph is not shocking or novel. At first there seems no reason for it to exist at all. Yet on deeper inspection it becomes apparent to me that it may be representative of more poignant ‘concerns’. Only if the image is intriguing enough though, will the viewer try and find any deeper meaning in it. Undoubtedly Friedlander has achieved this wider ‘interest’ here - and through his practice as a whole - for his work has come to be judged as one of the most important ‘bodies’, and he one of the most cited figures, within the history of photography. The notion of an implied ‘narrative’ or referential statement is what interests me. With this in mind, I believe a theoretical, and greater symbolic meaning is evident in this photographic work. 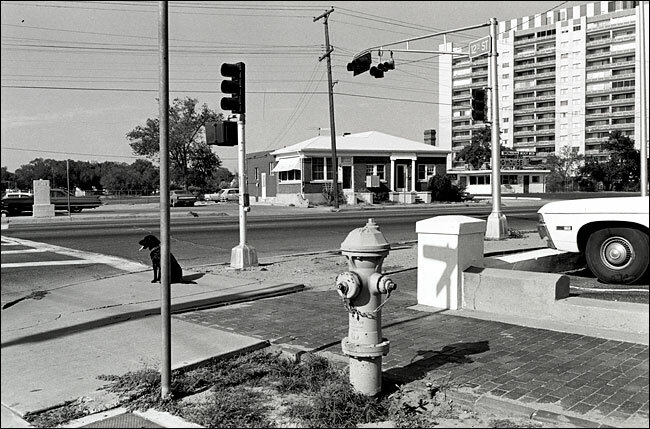 Friedlander’s image shows a dog sitting at an ‘intersection’; alone, it is engulfed by its stark surroundings. What I have attempted to do when viewing this photograph, is think about the social and political context of the work’s origins. I deconstructed the image with this as a primary consideration and it started to suggest to me a variety of different connotations. The Dog is alone and is in contrast, both physically and symbolically with this very light, bright, white, well ordered; almost pristine environment. The apartment block is a formal linear construction. Modern and utilitarian, this building is typical of the street scene itself. This structural trend is contrasted by a detached house. Also just as modern, however it has a ‘mock’ Georgian entrance complete with pillars and garden features. This house seems synonymous with a wealthy old colonial home, with its clear imperialist connotations. The notion of ‘individual’ power and wealth – a ‘divide and rule’ mentality linked to US history itself – in relation to this building, could be assessed as making reference to the Slave Owner’s residence; separated and austere. This historical observation and assumption will help legitimise my reading further. The Dog is visually dissected by the lamp-post. He appears to be calmly waiting to cross the road. Potential danger waits as he is alone, a hazardous prospect for a dog or for one who cannot see the ‘other side’, as is the case within this frame. The symbolic nature of this potential ‘journey’, and the imagery as a whole, will too relate to my reading of this image. This leads me to my analysis of Friedlander’s photograph. I suggest that this image can be interpreted as a comment on the civil rights movement in America, specifically during this period and from the decades leading up to 1972; when the work was made. The Dog in the photograph is at odds with its environment - cast out in a sense. This animal creates a contrast between both living and non-living objects, and between black and lighter tonal areas. This is a totally black dog in a comparatively white, bright scene. This creature has been visually intersected; symbolically ‘cut in half’ by the lamp post - an object synonymous with the modern city - in which black society had constantly been castigated from. For the centuries leading up to this moment, and beyond, they had often been subjected to the most heinous treatment; everything from extreme verbal abuse to actual lynching and murder. Even if significant progress had been made by this time – in 1972 they were still not completely socially accepted by everyone and certainly any notion of ‘equality’ was a long way off - especially in the American Deep South where this picture was taken. If therefore, the Black Dog is considered a metaphor for the standard of treatment and the oppression of black people by the white ruling establishment, then in my view this image acts as a fitting allegory. The Dog as a symbol, in relation to my reading, connotes the sub-human status devastatingly inflicted on Black Society. Its lonesome reflective nature, calmly and in a dignified way, awaits the ‘unknown’. This invisible ‘change’ or progress is mirrored in the fact that we cannot see the other side of the road. Its presence although, also recalls the dogs used in many riots by police and racists to often assault, harass and threaten black people. On the other hand crucially however, this Dog’s existence here is totally at odds with both the aggressive nature, and the breeds, associated with those kinds of dogs. Its calm considered pose therefore links back to the largely honourable way in which the civil rights movement was conducted and eventually won through a collective sense of unity and by diplomatic means. Another visual clue in this regard is the main focus of the image -the fire hydrant. I see this as a visual ‘gag’. Perhaps this is an ‘artistic nod’ to the documentary images of street photographers like Helen Levitt (1913). In many of her works (and her numerous contemporaries besides) the hydrant is presented as a source of fun and play for the working class children - and typically kids from largely ‘minority’ or ‘non-white’ neighbourhoods (Figure 2); as depicted in her work Untitled, New York (1942). Conversely though, I also suggest that this too symbolises the high powered jet hoses infamously used by the police when controlling many black people and other civil rights protestors; and is related too much of the police brutality which took place during this historically period. As the Dog is directly in the ‘firing line’ of one of the hydrant’s valves - and the potential jet powered stream it contains - then this reading becomes synonymous with both these cited references as it effectively combines my two associated readings. Central to this image (and to Levitt’s also) is the act of ‘crossing’ the road - an attempt to make it to the ‘other side’. In the case of Albuquerque, New Mexico, this side is concealed as it is outside the frame of the image. Through this reading, I am reminded of Martin Luther King’s prophetic, final speech, when he articulates using an array of biblical metaphors: “I have been to the mountaintop; and I have seen the Promised Land”; and even more pertinent to this interpretation, when he utters the moving words: “That we as a people can get to the Promised Land”. In my view his sentiments provide this photograph with connotations that are deeply affected by notions which surround equality, ethnicity, society and politics. The “difficult times ahead” that King also spoke of on this occasion, are manifest in the fact that this black Dog has been ‘captured in time’ as is photography’s way. The image will never allow the Dog, now or ever, to make it across the road, to the unseen other side. This ‘other side’ represents the imagined “Promised Land” which Dr King alluded to in this speech; as he had done consistently through out his political life. This environment is clearly intimidating to the solitary Dog. King’s situation was made hostile, unforgiving and often antagonistic to him also. The symbolic journey that King was undertaking, and leading many others on as well of course, tragically culminated in the ultimate act of aggression and violence towards him. When considering ideas connected with political change and social equality, one must think about these issues in relation to ideology. Ideological change is adequately described by Louis Althusser (1918 – 1990) in “Thesis II” from his essay Ideology and Ideological State Apparatuses: “Ideology has a material existence” which manifests itself as ownership and commodities. There is only change or ‘something else’ when it is perceived to benefit the financial powers of the adopted ideological system. This helps structure some of my sentiments relating to Friedlander’s image. As a result, the Dog in the photograph, for me, is in complete contrast to the soulless, bright, ‘white’ surroundings. Hidden behind a seemingly innocuous view, this is reflected in the unseen troubles of the tower block in the background of the image; similar to many others like it in neighbourhoods all around America. In this controlled and well ordered setting there is a society subtly at odds with itself. On show is the “bourgeois-decadent minimalism” that Mike Davis (1946 - ) discusses in his book City of Quartz, a text which deals with the notion of the ultimate “postmodern city” – secure, yet utterly divided. This facet of a divisively structured modern city is too subtly reflected in Friedlander’s image. This quote embodies the fundamental nature of what this, and many other postmodern photographic artworks challenge the viewer to do. To not just simply see the literal meaning of the physical objects and subjects they contains, which may in countless cases seem arbitrary on first inspection. But the challenge with images of this kind, in my view, is to attempt a deeper and more meaningful understanding as to why they have remained important works within the history of art and their media. In the spirit of this task of subjectively deciphering an image, my own process of elucidation is what I have tried to expressive in this paper. The method deployed here therefore, for an in-depth scrutiny of the image, I judge, reveals meanings and connotations of socio-political and culturally historical significance. Of course all these views are my own. I am not suggesting that this is what Friedlander necessarily intended the viewer to think about when viewing his work. Nevertheless this ‘loss of control’ is the time worn trajectory of the artist. Once the artwork enters the communal visual ‘arena’, the work leaves the artist’s critical domain and they lose exclusivity over it. How ‘open’ it is, and worthwhile it becomes, in terms of examination and interpretation, is down to many factors. What I have attempted to describe here is how the stylistic traits and formal considerations associated with Postmodern Photography (which this work is a prime example of) have allowed for a greater and more meaningful analysis of this photograph - and the many images linked to this category - to be made. Martha Rosler, ‘Lee Friedlander, An Exemplary Modern Photographer’, in Decoys and Disruptions: Selected Writings, 1975 – 2001, (London: An October book, Cambridge Mass. Press), 2004, p. 114. Louis Althusser, ‘Ideology and the state apparatuses (notes towards an investigation)’, chp. 19 in Visual Culture: The reader, ed. by Evans and Hall, (London: Sage Publications, 1999), p. 318. Mike Davies, ‘Fortress L.A’, chp. 4 in City of Quartz, (UK and US by Verso, imprint of New Left books), p. 236. Rosalind Krauss, Photography in the service of Surrealism, chp. 1in Amour Fou: Photography and Surrealism, by Rosalind Krauss and Jane Livingston, (London: Arts Council of Great Britain, 1986), p. 25. Such excellent idea. The professionals from this website http://ezcollegepapers can help you with developing your work.